"The current work that most excites me is not my routine of making personal objects of clothing, but how those same skills and techniques can create a space for cultural exchange and deepening ways of knowing a place through both the plants and animals, as well as its social history. I seem to spend much time organizing events that use textile-related methods to create a social container - the space and context for something collective to unfold. 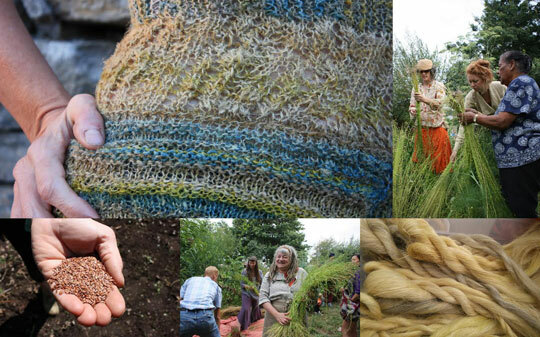 Relationships to place and people are developed through these collective moments of textile-based inquiry." 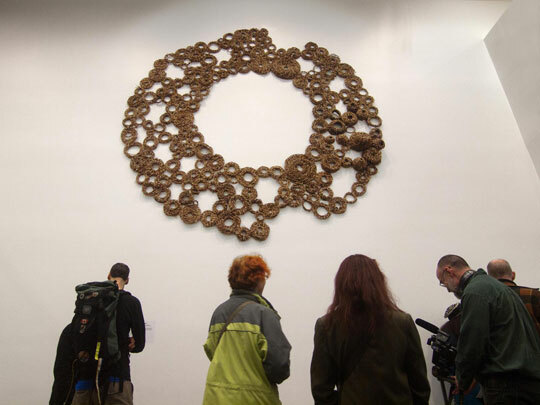 "The larger context for this work is based in a desire that pushes for culture change. What plants can grow in city parks? Having Vancouver Park Board nursery assist or support starting plants with traditional fibre use such as Dogbane, Fireweed and Stinging nettle (Apocynum cannabinum, Chamaenerion angustifolium and Urtica dioica) in city public lands has been a multi-year journey of conversation that brings us to a point of having these plants now growing in a city park. Plants usually seen through a gardener's lens as pest-like, too unruly to manage or not pretty and at worst dangerous can be celebrated and feed pollinators as well as a community of urban textile enthusiasts. Our nettle is mature enough to be used for many different classes and workshops, including dialogue around ethical foraging and methods of reciprocity with the plants we harvest. In the Land & Sea project, Coast Salish net-making traditions are being explored while conversations around fishing the coast transpire." "Mostly, I am thrilled and honoured to be at the heart of EartHand Gleaners Society, an organization that has quickly grown to be an exciting and vibrant community of skill and knowledge holders so willing to share and learn together." "Growing and knitting a linen shirt should not be noteworthy." 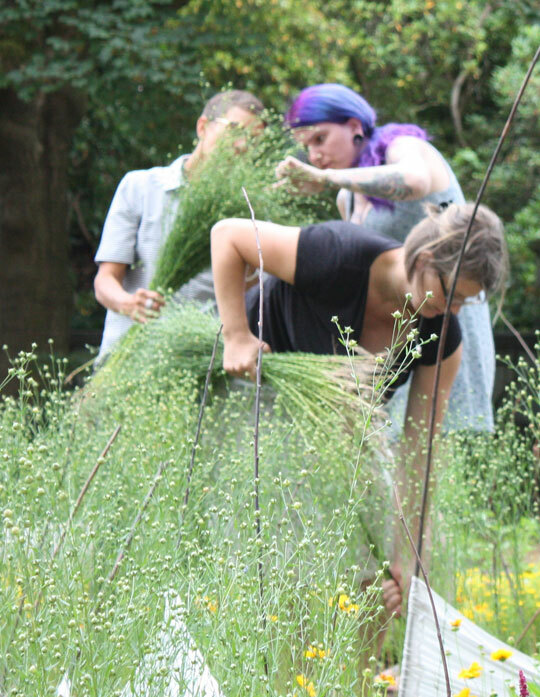 "Yet, in today's urban world it has meant for me involving hundreds of people in dozens of public seasonal work/party events over a 3 year time-frame where we have sowed, weeded and harvested flax. 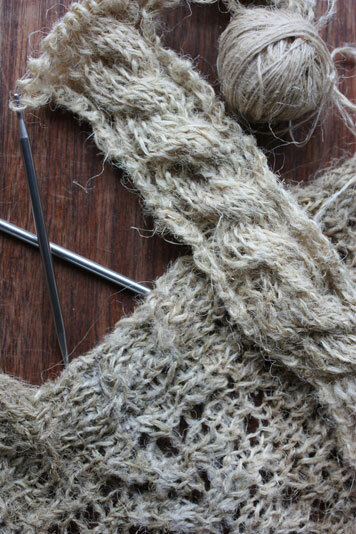 Slowly we have learned the subtle nuances of rippling, retting, breaking, scutching and hackling before my own spinning, dying, designing and finally knitting could begin. The shirt is merely a by-product to the larger ongoing project of re-educating people to where clothing comes from and the value of cloth. Through these celebratory, common-work events the hand processing of flax to linen is also guiding research into processing methods for wild fibres like stinging nettle." 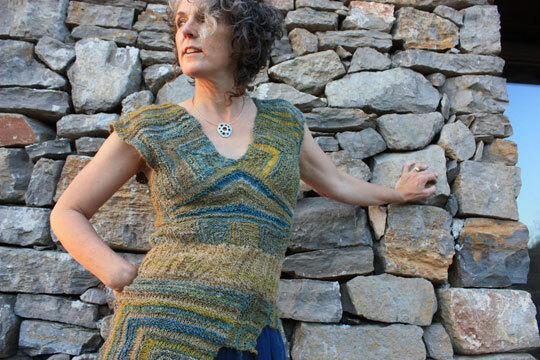 Sharon Kallis, From Seed to Shirt, 2012-2015. From Seed to Shirt - details. "Working primarily outdoors, I create site-specific community engaged installations. My focus shifts with what is seasonally at hand and I think of this as a 'one mile diet' approach to sourcing art supplies. My creative process begins with a harvest principal that embraces communal stewardship of the land; weeding, invasive species removal, coppicing, gleaning and gathering. Oral traditions of knowledge sharing occur; my own experience with plants and their uses are exchanged with those familiar to a place through close investigation of the surroundings; walking, sharing stories about the landscape and observed shifts in eco-systems. Installation ideas spring forth through conversation, idea sharing, identifying what materials are suitable for harvest and the consideration of the inherent physical properties of both place and material used. A site-responsive, collaborative improv with community unfolds." "The last four years has found me partnering with traditional Aboriginal weavers of both cloth and basketry techniques as well as working with other spinners, dyers and weavers. 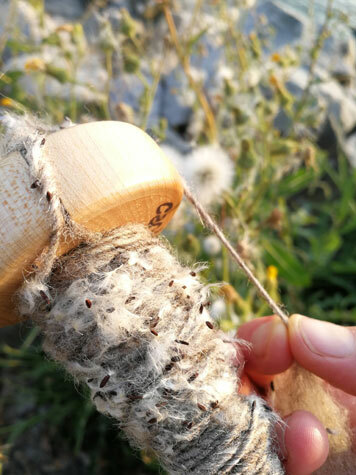 My spinning wheel came out of the closet, I learned to knit and have been growing flax for linen as well as experimenting with processing other harvested local plants into spin-able fibre. All of these activities unfold in a public manor teaching and learning with others in ongoing weaving and fibre circles." "Last year I started a new non-profit, earthand gleaners society, specifically to be able to continue this research and teach hand-based skills to others in my community. My partnership with Vancouver Park Board continues to grow, we are doing research on reusing the green waste from bedding plants for fibre dye and have been growing flax for linen in city parks. This spring a new park will open with specific plantings like Apocynum cannabinum (Indian Hemp). The new park, called Trillium North, has primarily indigenous to BC plantings chosen because of their usefulness and traditional use for First Nations hand-based technologies. The park, located on the edge of downtown, will be a working landscape, a return to a commons with shared crops. Park Board groundskeepers working alongside artist volunteers will manage and use the crops for local art production. 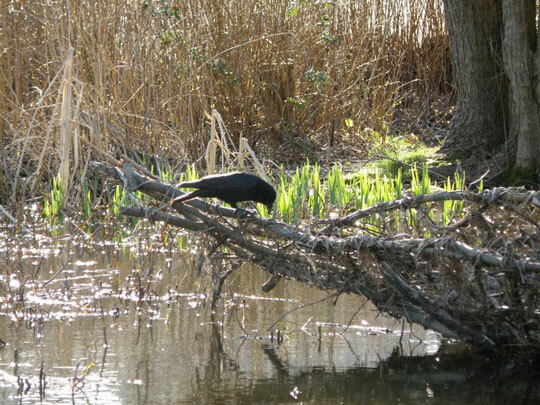 A radical change in how a city park functions!" 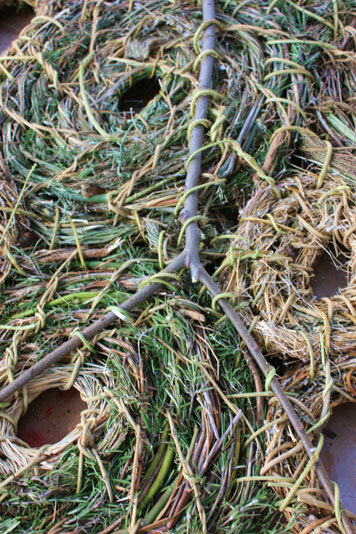 Dancing The Scotch Broom, 2012, featuring the processing of the invasive plant, Scotch Broom, in an effort to use it as a replacement for traditional weaving materials. 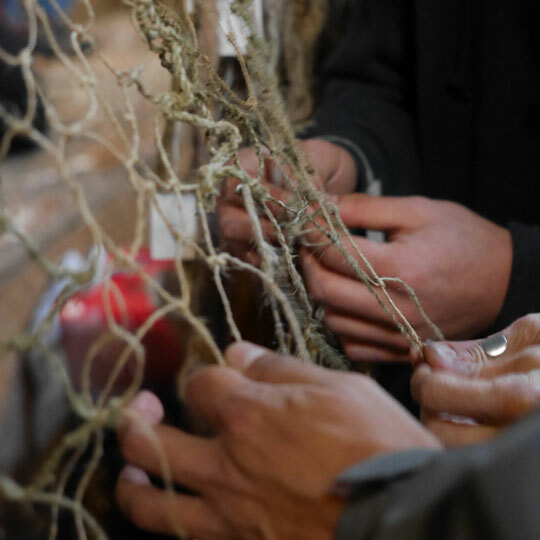 A project of The Urban Weaver Project, which brings together artists from diverse traditions to work with ecologists exploring the creative repurposing of green waste. English Ivy, split and un-split, 13 ft across, 300 coil basketry pieces stitched together, the 3-dimensional pieces made to spec for chickadee and nuthatch houses. Made in 2011 with several hundred community members in Vancouver. Commissioned by Science World, and shown indoors in a temporary location as a 3-iteration fractal of the basic form. The work will be moved outside into a different configuration as a semi-permanent installation on the seawall bike path. Coil basketry techniques taught to various community members using invasive Vitalba (wild clematis) as binding twine, with local fennel, rosemary, and verbena. 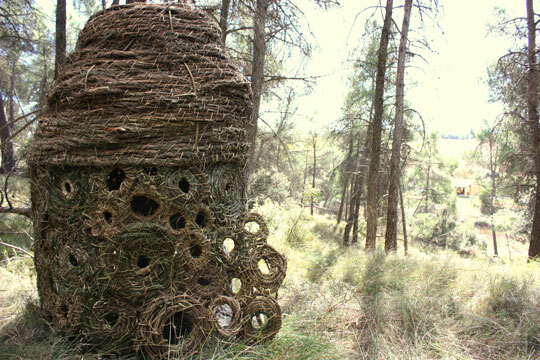 CACIS Residency (Centre for Contemporary Art and Dialogue in Sustainability), Calders, Spain. Barraca de vinya is the Catalan name for the rock dry-stack tool huts that stud the landscape in Catalunya as evidence of the land’s past ties to wine production - the sheds were built with rocks from clearing the land and stored farmers tools. Sharon Kallis, Barraca de Vinya, 2010. Detail - Barraca de Vinya. Interior struts bound on with vitalba. Sharon Kallis, of Vancouver, BC, has collaborated for the past few years with environmentalists, ecologists, and community members to forge a human/landscape relationship of stewardship and attention. Her creative process is driven by the twin desires to bring community involvement into the local management of invasive species, and to use ancient textile processes to turn the harvested plant materials back into a form that will support the re-establishment of native flora and fauna. To this end she has worked most recently on the Ivy Project at Stanley Park. The park was being over-run by English ivy, so volunteers from the Stanley Park Ecology Society removed almost five hectares of invasive material. 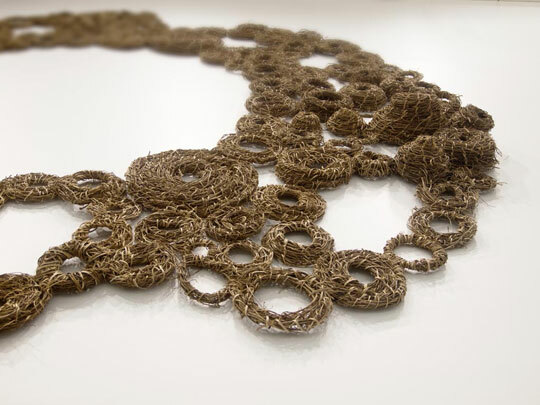 Under Kallas’ direction, the vines were dried and then netted, crocheted, or spool knitted into "nurse logs" and "bio netting" to hold eroding soil in place long enough for new native growth to return. As these elements gradually decay and allow for a succession of growth, the environment will become a collaborator as well, bringing the cycle full circle. English ivy, assorted park maintenance branch waste. 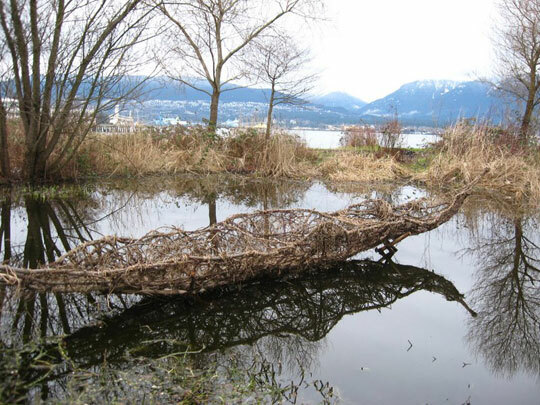 Collaborative project in Stanley Park, Vancouver; a total of 200 volunteers over four days participated in pulling ivy, building a structure, and weaving the ivy boat. Sharon Kallis, The Ivy Boat, 2009. Detail - The Ivy Boat. Kallis describes her role as that of “a traveling catalyst,” a new element in the environment, spring-boarding the community into seeing the local landscape from a fresh perspective. Traditions of handwork, often springing directly out of the locale into which they are re-deployed by Kallis, underline a way of being present that is often divorced from our actual experience of being in a place. Sharon Kallis has held residencies in Canada, the US, and most recently Catalonia, Spain, working with communities and woodlands. By learning traditional making processes from elders and then re-inserting them into the environment in this collaborative way, she encourages dialogue, fosters communication across different segments of the community, and literally knits together the landscape and the people who inhabit it. – Fran Dorsey. Originally published in the Textile Society of America Newsletter, January, 2011.